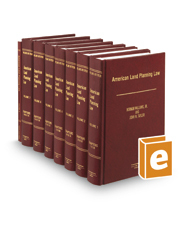 Examines the changing priorities in zoning and land use practices, focusing on the relationship between private activity and governmental power, and analyzing over 15,000 cases from all 50 states. Provides case updates on such topics as exclusionary zoning, historic and commercial districts, landmark designation and architectural review. Discusses recent developments in the preservation of open space, state and regional land use controls, and impact fees. Anticipates future judicial and administrative trends, and analyzes commercial and industrial land use. Explains administrative aspects of zoning and other legal controls. Provides detailed index, cross-references, and tables of cases by plaintiff and defendant.